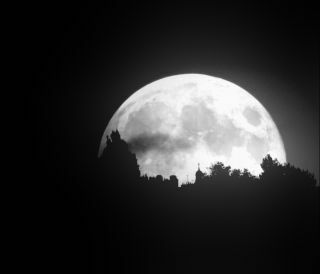 The full moon in this image is the first after the solstice on June 20, 2012. This photo was taken by photographer VegaStar Carpentier of Paris, France, on July 3, 2012. A gigantic full moon looms over Paris in this spectacular night sky view. Astrophotographer VegaStar Carpentier took this magnificent photo on July 3, 2012 using EOS Canon 1000D camera with 300mm lens and an exposure of Exp.1/15 seconds. The July full moon is the first after the solstice on June 20 this year. This moon is commonly called the buck, hay or thunder moon in North America to mark when young bucks grow antlers, farmers work on bales of hay and thunderstorms arrive. A full moon occurs when the orb is directly opposite the sun. This means the moon can fully reflect the light of the sun giving it a beautiful glow. The time between one full moon to the next is called a “synodic” month and takes 29.53 days.